Quictent is one of the top brands who sell high quality structures like Greenhouse, grow tent, marquees, gazebos, camping tents etc. Quictent greenhouse, being in fashion for years, provides one year warranty and excellent after-sale service, within the Warranty Period, the replacement for any defective part of this greenhouse will be supplied free of charge. 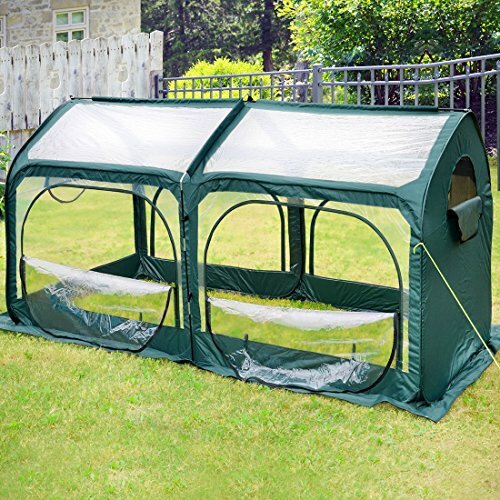 Let your garden grow year round with this compact, lightweight, portable greenhouse, set up in less than 5 minute--- no tools required. 2.Full closed cover maintain high humidity levels, and keep an appropriate temperature for growing tropical plants, vegetables, fruiting plants and herbs. 3.Double pull head, convenient and quick operation. 5.Cloth buckles around, for extra ropes and stakes in rainy days. 6.Unique buckle design, effective protection of the rolled door. ECO-FRIENDLY MATERIALS - This Greenhouse access to the SGS test report recognition. Fine processing of 600D oxford combined with 18mil clear PVC cover, Waterproof UV protection. 1.5mmx6mm steel-wire rods and 8.5mm fiberglass poles, with high-end quality and unique design, good performance and longer life to use. 6 STAKES PROVIDED -- To help strengthen the tent, the greenhouse has special design of cloth buckles around the tent, so that you can use extra ropes and stakes easily in bad weather. 4 LARGE ZIPPER DOORS-- Rolling from upper part. Unique buckle design, effective protection of the rolled zipper door, you can walk in greenhouse easily. Two zipper screen windows, adjust the sunlight and temperature inside.